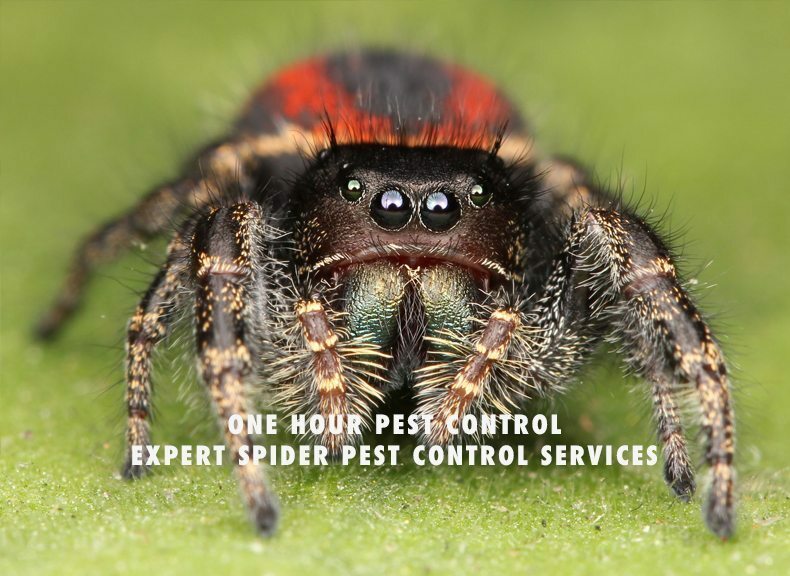 Choose The Right Spider Extermination Solution! While spider sprays can be effective in the short term, they are not a lasting solution to an infestation. Families with pets or young children should be wary of using all insect poisons and sprays, due to the potential of accidental poisoning. With so many dangers associated with trying to exterminate a pest problem yourself, most families turn to the professional exterminators at One Hour Pest Control for a safer, lasting solution. Professional and affordable, we will quickly fix your infestation the first time, so you can stop worrying about the problem reoccurring. With the fastest response time of any companies in the area, One Hour Pest Control specializes in emergency situations where no time can be spared. You shouldn’t have to worry about the safety of your family in your own home, and One Hour Pest Control can help ease your mind and make your home pest free again! Offering services in NYC, Brooklyn, Bronx, Queens and Long Island City, One Hour Pest Control is the quickest, safest solution to all of your pest problems! Keeping your home neat, tidy and free of dust or webs is the best way to keep spiders from moving in. Regular vacuuming, dusting, and de-cluttering will keep any insects from making themselves at home! Focus on garages, basements or sheds, where there is little foot traffic and nests can grow unnoticed. Make sure the exterior of your home is free from leaves, grass clippings, wood piles, or any other notorious spider hangouts. You can also check all door openings and windowsills to make sure there isn’t room for spiders to get in that way, and apply caulk when needed. What Do I Do If I Am Bitten By A Spider? If you did not see what bit you, or if you think it was a nonpoisonous spider, wash bitten area with warm water and soap. Cover and check bite area regularly to check to make sure no symptoms develop. Symptoms include: local pain, redness, burning and swelling at bite site, abdominal pain, muscle cramps, headache, rash and itching, sweating, eyelid swelling, salivation or tearing of the eyes, weakness, tremors or paralysis, nausea or vomiting, dizziness or fainting, chest pain, respiratory difficulties or high blood pressure. Most spiders hide during the day, coming out at night to feed or find a mate. They tend to hide in dark, little used areas, such as garages, basements or closets. Special care should be taken to always look before you reach into a dark place, since they like to hide in covered corners of the house as well. Taking garbage cans out during the day is a preferred way to not be bitten, since they like to make webs on the perimeter of the house. The breeding season of the black widow spider occurs between late spring and early autumn, with the female laying eggs into several pear-shaped egg sacs, which are white, tan or grey and have a paper-like texture. These sacs can contain up to 400 eggs and are suspended within the web, with the female keeping guard nearby. Do not try to remove these eggs sacs yourself! Irritation to the sac can cause it to burst, releasing hundreds of baby black widows onto you or into your home. Call an exterminator if you see any sacs or multiple thick, sticky webs around your home. Leaving a situation unattended could result in hundreds of poisonous spiders hatching and infesting your house, putting your family at risk. Spider bites in New York blamed on brown recluses are more probable to be bites attributable to the much more common yellow sac spiders. These spiders are pale yellow, and like the brown recluse, they hunt at night and hide during the day. In the garden, their hiding places are likely to be under rocks or inside rolled-up leaves, in which they build silken tubes in which to hide. A sac spider bite is usually painful initially, and in some individuals it may cause cramping, nausea and other symptoms similar to those of a black widow bite. Eventually, an open sore or tissue death similar to, but less severe than, that caused by a brown recluse bite may occur at the site of the bite. While a Sac Spider bite normally proves to be merely painful, it can lead to more severe symptoms, which you should go to a hospital for immediately. Mature females are the most venomous spider in North America, with a bite that can be deadly. They are black with a red hourglass on the belly, easily visible as the spider hangs upside down in its web at night. By day, they hide, usually in dark garages, closets or basements. The female black widow builds a tangled web in a secluded area, such as under a woodpile or low-growing foliage, on a fence or stone wall, or inside a garden shed or basement. It rarely leaves its web, where it stands guard over its egg sacs. When the spider or its eggs are threatened, it may bite. Immature females have pale stripes and spots, gradually losing those markings as they age. Symptoms may vary for each individual, but when a bite occurs, go to a hospital immediately if any symptoms develop. Originally native to Europe, it has become established in southeastern Canada and the eastern U.S. This robust spider is common in and around homes, but also lives under rocks, logs, in leaf litter, and other dark, humid places. A pattern of lighter areas or spots (which sometimes run together) can produce a larger, lighter central area. It is common to have chevron-type lighter areas on the posterior portion of the abdomen. The web is an irregular “mesh” with an ill-defined tube retreat in the areas previously described. Their bites are not known to be dangerous but, like most spiders, can be painful. Adult males are notorious for wandering in the spring, and are especially drawn to kitchens and food storage areas.